The Adult Immunization (AI) Best Practices Learning Collaborative was designed for organizations that strive to improve their adult immunization rates. Working together, the participating groups identified optimal and efficient ways to improve adult immunizations, with a specific focus on pneumococcal and influenza vaccines. The pilot Collaborative (Group 1) brought together seven AMGA Analytics member organizations from February 2015 to April 2016. These organizations collaborated to improve adult immunization rates for pneumococcal and influenza, thereby reducing the clinical and economic burden of these vaccine-preventable diseases. One focus of the Collaborative centered on the new CDC guidelines for pneumococcal vaccines in patients age 65 and older. The Collaborative was successful in increasing rates of compliance with the guidelines from 4 percent to 34 percent over the course of the 14-month intervention period. All of the groups demonstrated measurable success (see Case Studies below) and intend to continue their efforts and share their learnings outside of the Collaborative. 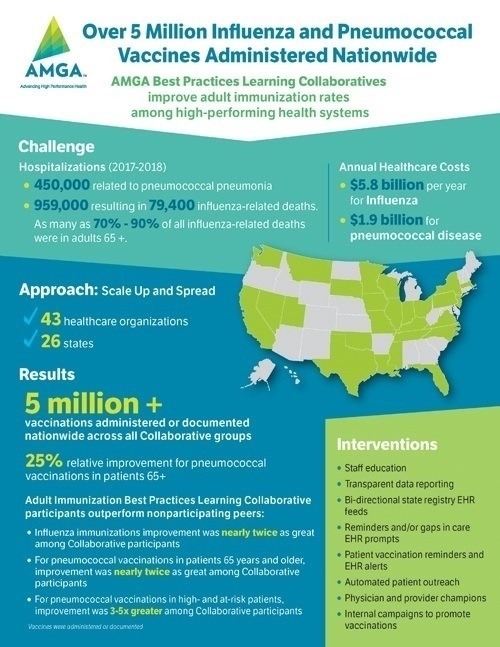 AMGA worked together with all seven participating organizations to develop the Adult Immunization (AI) Best Practices Learning Collaborative Compendium. The Compendium includes case studies from each of the medical groups, academic practices, and integrated delivery systems involved in the Collaborative, each of which achieved improved adult immunization rates.